I love social media for so many reasons! But one of the biggest is the way it allows us to find out about and connect with other businesses, like the Palms Retro. The owners of the retro-inspired hotel reached out to us recently (thanks to Instagram!) and invited us to enjoy a little stay-cation in our own backyard. So last week we packed our bags and headed a few miles east for a relaxing stay in Atlantic Beach, one of our favorite areas of Jacksonville. The Palm Retro is a motor court style hotel that was built in 1947 and renovated in 2009. 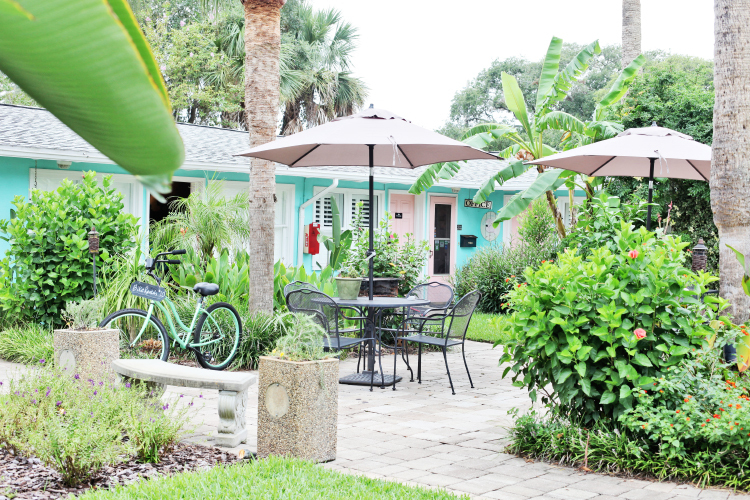 Back in the 40’s and 50’s, motor court inns dotted the beach area, but now the Palms Retro is one of only two hotels that have maintained the historical integrity of the era. 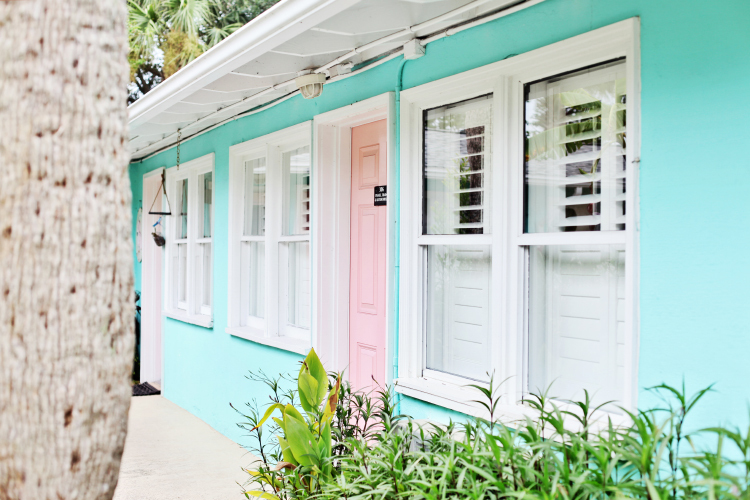 I love all things retro, so staying at the character-infused hotel was a treat! One of my favorite features of the hotel is the beautiful lush courtyard. It’s very “old-Florida” and feels like a step back in time. It’s the perfect spot to relax in the evenings or enjoy breakfast first thing in the morning. I also loved the kitschy, themed rooms. Each of the hotel’s 10 rooms are different and decked out with unique touches. (Our room “The Tube” featured a giant photo of Barney Fife!) There’s also a diner-themed common area where they serve breakfast and coffee each morning. Kingston loved all the decorations! And the building itself is painted in my favorite colors, so I took more than a few pictures of the exterior! The hotel is located just a few blocks from the busy Beaches Town Center, so we opted to walk to dinner (then later to dessert!) but also drove to some shops and the beach a couple of times too! If Kingston hadn’t been with us we would have taken advantage of the hotel’s bike rentals. Anderson kind of made me promise to do this with him soon, even though I can’t really ride a bike-ha!! The Palms Retro’s mission is to connect guests with the local culture, so they established co-branding partnerships with a few businesses in the area: Mezza Restaurant and Bar (one of my favorite restaurants at the beach), Drift | Modern Boutique, and Yoga Mix. Guests receive a discount by showing their room key at these spots. And speaking of room keys… I don’t remember the last time we stayed in a hotel that required actual keys to get in the rooms! 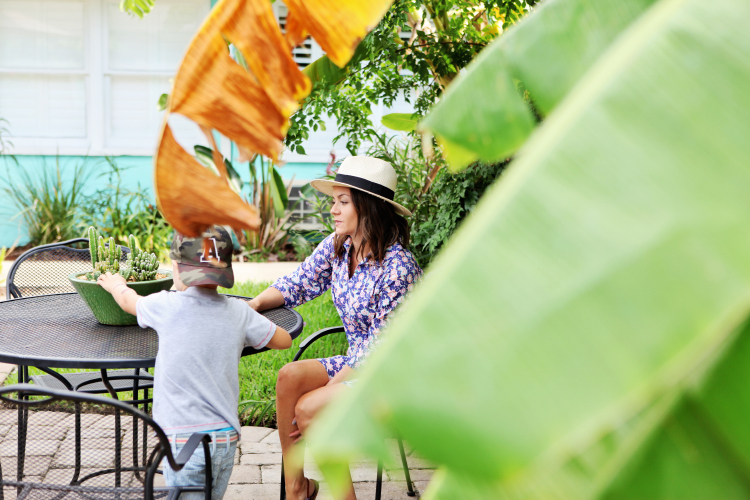 We loved our stay at the Palm Retro, and I’m excited that we now have a fun, local place to suggest to friends and family who visit from out-of-town. Staying here will make them feel like they’ve really experienced the area, and that’s one of my favorite parts of travel… living like the locals! I also think it would make the perfect spot for a girls’ trip or family event. How much fun would it be to rent our the whole place for a wedding or family reunion?! Thanks to the Palms Retro team for making our stay so enjoyable! We will definitely be back!